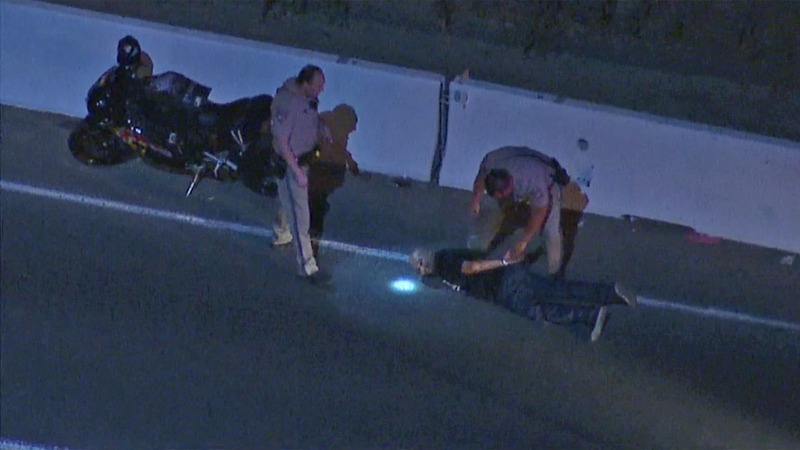 ANAHEIM HILLS, Calif. -- A motorcyclist was taken into custody when his vehicle ran out of gas on the 91 Freeway after leading authorities on a dangerous high-speed chase Thursday night. Around 8:15 p.m., authorities attempted a traffic stop near the southbound 605 Freeway and Slauson Avenue in Whittier. The suspect then fled the scene in his blue motorcycle, traveling at speeds as high as 115 miles per hour to evade police through Orange and Riverside counties. After speeding through multiple freeways, the suspect's motorcycle ran out of gas on the eastbound 91 Freeway near Grand Avenue in Corona. He simply stepped off his bike and waited on the shoulder until authorities arrived. He was taken into custody around 9:15 p.m. by California Highway Patrol officers.